Salt buildup typically occurs in dry areas where evaporation exceeds precipitation. Over time, as water evaporates, the minerals left behind begin to accumulate. Plants need a certain amount of soluble salts, but when the salt content of soil water is greater than that of the water inside plant cells, the plant roots cannot absorb the soil water. The degree of salinity at which yields decline depends on the crop. Quinoa (Chenopodiumquinoa), for example, is quite tolerant of salinity, whereas many annual vegetable crops are much more sensitive. 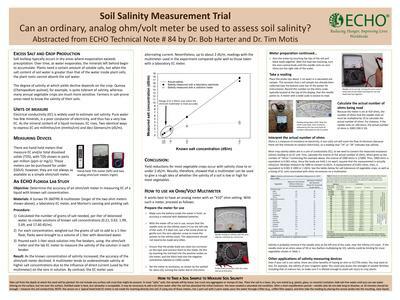 Farmers in salt-prone areas need to know the salinity of their soils.